When the Make-A-Wish Foundation grants a child’s wish, it often receives requests for a trip to Disneyland or a tropical beach. But that was not 12-year-old Collin Nishimoto's wish; he chose a reunion with his Rady Children’s Hospital care team. In March, Collin and his family traveled to San Diego from their home in Hawaii to make Collin’s wish come true. 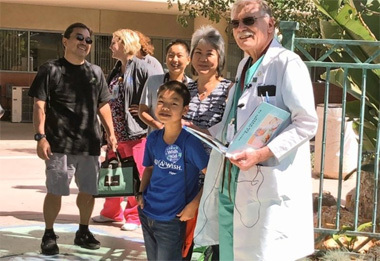 “I am really happy that he chose us,” said John Lamberti, MD, a pediatric cardiovascular surgeon at Rady Children’s. Prior to Collin’s birth, his mother, Paula, underwent testing in Hawaii that revealed an extremely complex congenital heart defect. “There was a big hole in his heart. The blood vessels were reversed. The artery to his body was too small, so this is about the most complicated defect that you can have,” says Dr. Lamberti. Collin put together a scrapbook from all of his memories at Rady Children’s and dreamed of returning to reunite with his care team who helped him through four heart surgeries. And so his wish was granted.